In my previous post, I’ve mentioned how much I like to make my own Christmas tree ornaments. Even though homemade craft is not my forte, I can imagine the satisfaction you’ll get from the end product, regardless it’s good or bad. Unfortunately, if owning a hot glue gun (for a start) is a prerequisite to crafting at home, all I can say is not only I don’t have the “talent” but also the necessary “gadget” to expand my crafting skills. 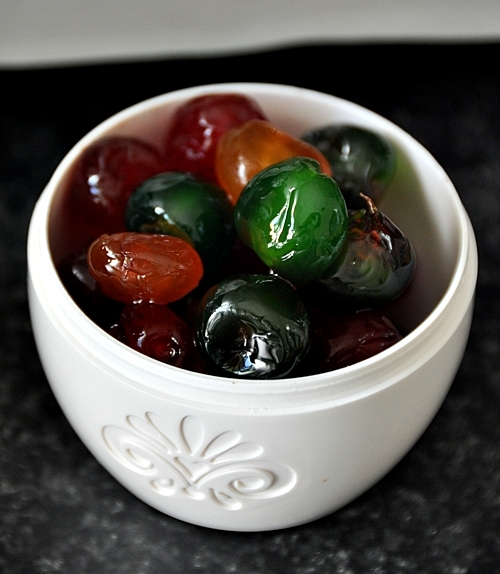 There are many ways we can go about making edible decorations. For a start, we can bake some gingerbread cookies and then glazed them with pretty pastel coloured icing; and if you’re infatuated with blings, there’s nothing like sparkly sprinkles and edible pearl cachous can’t do. And don’t forget about popcorns garlands? Love those too! That said, I thought it would be fun and special to add these biscotti ornaments to my growing list of Christmas decoration ideas. What do you think? Taste or aesthetic? The original recipe specifies 1 1/2 cups of glace cherries which I think it’s a bit excessive for my taste. So I’ve reduced to 3/4 cup which I’m glad that I did. Otherwise, the biscotti would be overly (sickeningly) sweet. That said, for aesthetic purpose, the original portion would garner more “stained glass” effect as compared to mine. 1. Preheat oven to 180 degrees Celsius (350 degrees Fahrenheit). Grease oven trays or line with baking paper. 2. 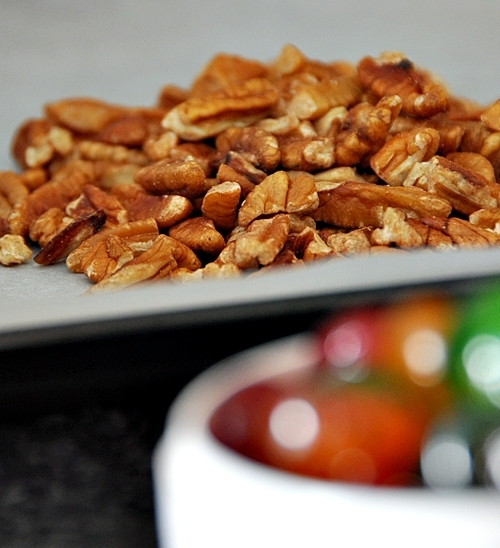 Hand whisk sugar and eggs in medium bowl until combined; stir in sifted flour then cherries and nuts. 5. Place logs on tray and bake about 30 minutes. Cool the logs on tray for 10 minutes before cutting into slices of biscotti. Meanwhile, reduce oven temperature to 150 degrees Celsius (300 degrees Fahrenheit). 6. Using serrated knife (I found steak knife to be useful), cut logs diagonally into 5mm (1/4 inch) slices. 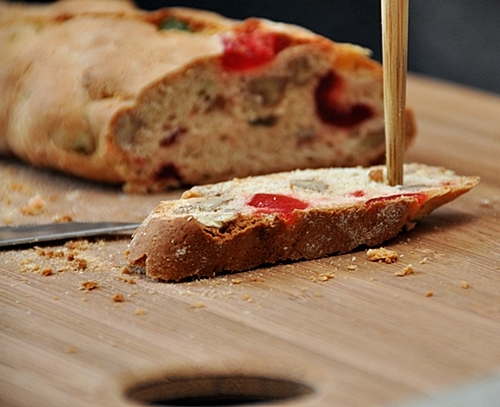 If you are to use some for Christmas tree decoration, create a hole near the end of the biscotti with a chopstick – this is where you’re going to thread a gold string through the hole and hang the biscotti. 7. Place slices, in single layer on baking paper lined trays and bake for about 30 minutes or until dry and crips, turning halfway through baking. 9. 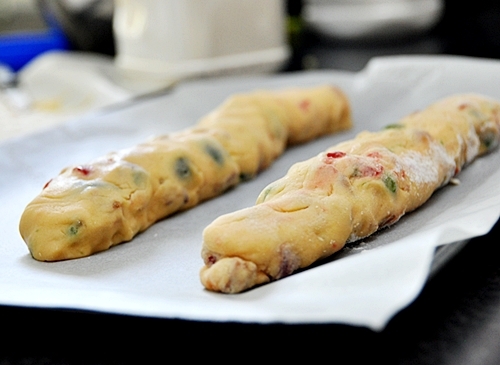 Once cooled, start to thread the biscotti. If you’re having trouble threading (due to the final baking in step 7) use a toothpick / satay stick to “clear” the hole. I absolutely love your presentation. 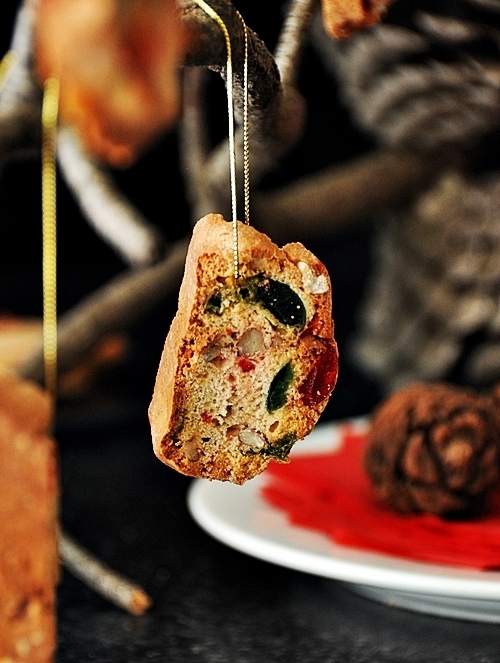 It such a festive photo with your beautiful stained glass biscotti….a definite FB buzz from me. Your photos looks breath taking. 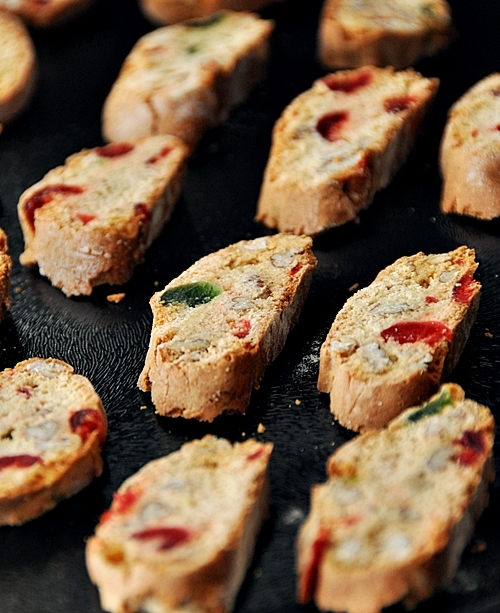 Love the idea of making your own christmas biscotti and use it for christmas tree decoration too. lol Thank you for sharing this recipe. 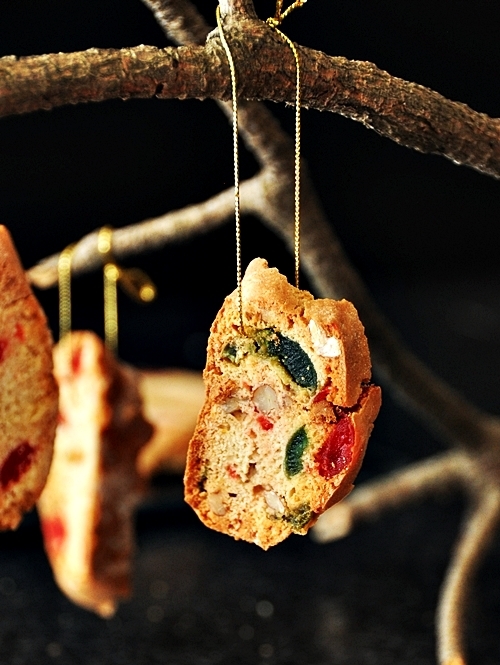 I love biscotti, what a great idea for ornaments. They look so pretty! I love biscotti. It’s a shame I don’t like galce cherries though. What a lovely festive idea. Great styling hanging them from the branches, too. Beautiful! I’ll bet they taste good, too! That is such a clever idea Emily! They look very pretty on a tree and (if i have a party) my guests would go all over it. your photos are absolutely stunning! hey dude are you coming to the sydney food bloggers picnic on sat?